The Ukrainian government will dismiss 39 high-ranking officials as part of the country's new lustration law, Prime Minister Arseniy Yatseniuk has said. "In accordance with the basic norm of the lustration law, the government of Ukraine will dismiss a total of 39 high-ranking officials. Of them, 19 have voluntarily handed in a letter of resignation, and the other 20 will be dismissed under the norm of Ukraine's lustration law," he said at a government session on Thursday. Besides, the government requested the president dismiss the head of Kirovohrad Regional State Administration based on the lustration law. 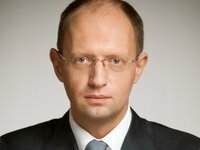 Ten heads of national commissions will be also dismissed, Yatseniuk said. "Thus, the Cabinet of Ministers passed a decision to dismiss high-ranking officials who do not meet the requirements of the new law, who will not be able to work in the government in the next ten years. These are heads of central executive agencies, first deputy ministers, deputy ministers, members of national commissions and one head of the regional state administration," the prime minister said. "We expect that the president of Ukraine will swiftly endorse the dismissal of these officials," he added. At the same time, Yatseniuk stressed "that this is only the first stage," and then the Cabinet would approve a plan of inspections in government agencies in accordance with the law on lustration.